A photographer friend of mine implored me to find and download images of picture frames from the internet. I eventually landed on a web page that had a number of them available for free but there was a problem: a link to download all the images together wasnâ€™t present. I didnâ€™t want to go through the stress of downloading the images individually, so I wrote this PHP class to find, download and zip all images found on the website. It searches a URL for images, downloads and saves the images into a folder, creates a ZIP archive of the folder and finally deletes the folder. The class uses Symfonyâ€™s DomCrawler component to search for all image links found on the webpage and a custom zip function that creates the zip file. Credit to David Walsh for the zip function. The class consists of five private properties and eight public methods including the __construct magic method. Below is the list of the class properties and their roles. 1. $folder: stores the name of the folder that contains the scraped images. 2. $url: stores the webpage URL. 3. $html: stores the HTML document code of the webpage to be scraped. 4. $fileName: stores the name of the ZIP file. 5. $status: saves the status of the operation. I.e if it was a success or failure. Letâ€™s get started building the class. Create the class ZipImages containing the above five properties. Create a __construct magic method that accepts a URL as an argument. The method is quite self-explanatory. The created ZIP archive has a folder that contains the scraped images. The setFolder method below configures this. By default, the folder name is set to images but the method provides an option to change the name of the folder by simply passing the folder name as its argument. At this point, we instantiate the Symfony crawler component to search for images, then download and save all the images into the folder. After the download is complete, we compress the image folder to a ZIP Archive using our custom create_zip function. Lastly, we delete the created folder after the ZIP file has been created. Get the status of the operation. I.e if it was successful or an error occurred. Process all the methods above. You can download the full class from Github. 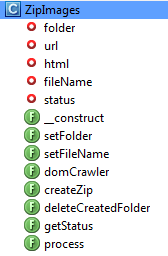 For the class to work, the Domcrawler component and create_zip function need to be included. You can download the code for this function here. Run $ php composer.phar install to download the library and generate the vendor/autoload.php autoloader file. Make sure all required files are included, via autoload or explicitly. Call the setFolder , and setFileName method and pass in their respective arguments. Only call the setFolder method when you need to change the folder name. Call the process method to put the class to work. In this article, we learned how to create a simple PHP image scraper that automatically compresses downloaded images into a Zip archive. If you have alternative solutions or suggestions for improvement, please leave them in the comments below, all feedback is welcome!